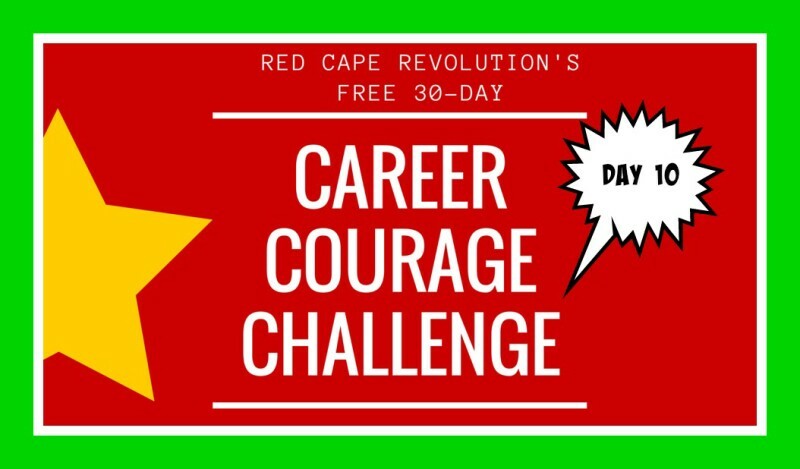 Welcome to Day 10 of our Career Courage Challenge. How’s it going so far? Tell me in the Comments at the end of this article, or on Facebook and LinkedIn, too. Don’t forget– I’m taking the challenges along with you! Watch for my experiences in the Comments. In yesterday’s challenge, you listed what’s not working about your work (Day 9). Now, look at that list carefully. What’s one thing you canNOT change? Yes, it seems an odd exercise to identify things we can’t change, but recognizing what we can’t change helps us shift our energy toward the things we can change (watch for your future challenge to do just that). It lessens our frustration about some of the things not working because we recognize more clearly what we just have to accept, move on, and move past. This challenge takes courage because we often don’t want to admit that some things just are what they are. We want other things to change. But sometimes, the best solution may be that we’re the ones that have to change, and changing how we look at those frustrating things is a good place to start. My turn at bat for this challenge! One thing I can’t change about what’s not working at work: only 24 hours in a day, and at least a few of them need to be spent sleeping (if I’m playing smart, at least 8). So I can’t do everything–need to be choosy and focus on what’s most important.